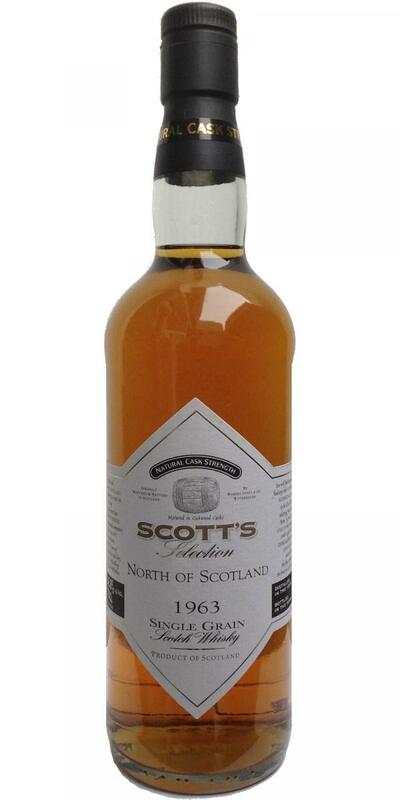 One of the oldest vintages of Nort of Scotland, both by distilling and bottling date. Courtesy by Greg. The nose starts with a lot of fruity sweetness of mango, pineapple and lychee. Vanilla and honey. Some cut grass. Baked bananas as well. Gentle pencil shavings at the background. For a grain this is very complex. Quite punchy! More on custard powder and cake mix now. Candy floss. Light toffee. Also lemon curd. Some corn and dried coconuts. Milk chocolate. Sugared almonds. It's all thick-syrupy and chewy. Medium long. Cinnamon. Clotted cream. A little ginger. N: I’ve read that for the first few years after its opening in 1958, NoS produced both grain and single malt whisky. For the first three years it ran malted barley through the continuous stills, but then changed to normal grain distillation. Originally known as the Strathmore, this is the first single grain vintage to be produced at the distillery as far as i can ascertain, and has a youngish single malt character to it also. Im nosing scorched/burned butterscotch popcorn, over-flambeed bananas, chrome, occasion wafts of lemon drops, smoked BBQ sauce, smoked paprika and some rubber with hints of sherry and [peaty]<briny=oiliness. It appears rather rough and ready with the distillate yakking away. A month later, its the same, but a little bit more delicious. T: Rather like the nose but compared to say the lovely Invergorden 1964 WB, this is a little off key. Initially it doesn’t taste like the greatest distillate by comparison - but on reflection [and like the nose], it has a single grain quality to it and a characterful one at that. On its own its more like an aged Tequila [reposado]. Doesn’t really develop but the profile is nutty, malty and well,… yep nutty and malty - and a little peppery with a suggestion of charred, oaky vanilla. Basic stuff despite all those years, yet theres a depth in that simplicity given all that time. F: Dry and quite thin at the end with some drinking chocolate notes. Dryish and grassy. C: Doesn’t show the best of what grain whisky can offer but compares favourably to a well aged, ‘natural style’ single malt. This is however a curious old grain that grew on me. Not sure I’ve drunk anything quite like it, with more to it than initially meets the eye as the analysing goes on. Are there any older NoS vintages than 1963? Compared to NoS 1971 WB and Invergorden 1964 WB, this is weak and shallow [basic rum like], but its buttery mouthfeel and sweet-herbal forest fauna finish shows the promise that was to follow from this excellent now closed distillery. A pleasure to experience, a [barley-based?] grain whisky. N: It often appears big and potent like its abv 60% +. It’s a nose where you can smell the distillate most clearly yet theres plenty of oak too. Most defining nose descriptors: old leather coats, malty earth, rocks, putty, a little dried mango & lime, burned oily rubber, tasted vanilla…. Definitely very different from the later, more refined/accessible outturn from NoS. T: Not a million miles away from the SMWS Caledonian G3.4 WB. Its got that same industrial thinness and vulnerability with a little tobacco and certainly some chocolate into the finish. Around two months after opening and I’m back home trying this after a whisky tasting. This follows then a Bunna 12, Glenalba 25, Port Charlotte PC8 and a splendid Strathclyde 9yo - and this cuts it. Very tasty, nice mouth feel, good consistency. its light but theres no vulnerability showing now. it’s spirity and its good - the oak supports well. F: Sugary spirit, but not by modern standards - like an old white aged rum, solid yet gentile. The mouthfeel, buttery white rum stretches out rather splendidly. C: Far better a few months later after opening. What a joy to experience one of the earliest, aged grains.